It's a pitty that there's no better place in Vranov and surrounding (at least we don't know about anything). They saved our day when we didn't get anything to eat in a restaurant U Vodnare, and were starving. 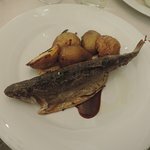 However, it was Vinobrani in Znojmo, the restaurant was full (including a school reunion) and there was just one waitress for the whole place. We were waiting for a long time and the food was moderate. We had a decent meal there finished even by a nice dessert. All was nice and tasty. The place itself is huge and accommodating. The only drawback was the guy serving. Could do with some manners like not rushing around for plates... Also when one brings a bottle of wine it is nice to let taste before you pour everyone. Had lunch here of penne and garlic soup. Good price and good service. Came back later for drinks and just as good. 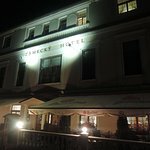 Been to Zamecky Hotel? Share your experiences!